White Ice granite is quarried in Brazil. It is a predominantly white colored stone intertwined with grey colored mineral deposits. Upon closer inspection you can seethe details of the granite. The grey specks and veins are found in light to dark hues, and some are actually a dark blue shade. Some can be very dark grey and black in color. The white bedrock is not a uniform color with variances in intensity and saturation of the grey colors. The quartz deposits throughout the stone shine and sparkle, especially when light hits the surface. 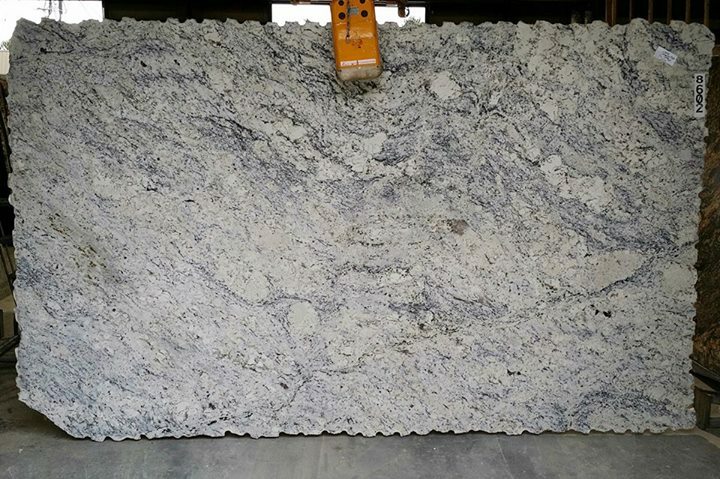 White Ice granite has a medium amount of variation between slabs. The main changes are the black minerals and the size of the grey patches. The darker grey mineral veins do not usually vary that much in their color intensity, but their size and frequency can differ quite significantly from stone to stone. The beauty of this granite color is that it can fit in perfectly with any style of kitchen décor. White Ice granite countertops paired with white kitchen cabinets is stunning with the white in the stone blending with the cabinets perfectly. The grey and blue veins in the stone provide a secondary tone to the area. With dark cabinets the countertops create a very different effect. The white in the countertops contrasts beautifully with the dark cabinets. The dark grey mineral deposits of the stone tie the countertops and the cabinets together. This creates a dramatic and elegant look to any kitchen or bathroom.